Do we choose to love? Or is Love a “predicament”, a “situation”, a “mental or emotional disruption” that happens to us? There are as many views and theories of what Love is about as there are people who have given a thought to that intriguing and exciting subject. Is Love a feeling, an emotion, or a state of mind? Is it the best thing that can ever happen to us, or a disaster which can ruin our life? Such and similar questions have been perpetuated by numerous writers, poets, performers, other artists, psychologists, philosophers and those who have ever been, or have hoped to be, in Love. We are all Lovers by nature. And that’s because, whether we are aware of it or not, we always have loved (one way or another) and we are filled with Love. When we are talking about Love, usually the first thing that comes to mind is the romantic Love, the one that fills us with passion, changes our heartbeat, and makes us devoted to the “one and only” person in the entire world. However, Love, as most of us have already found out, has many faces. There is the motherly/fatherly Love, the biological bond, which most of us have discovered as early as when we were in our mother’s womb. Then there is the family Love, known to us through our connections with our siblings, grandparents, or other relatives. Some of us feel Love for our pets, nature, town, country, or the entire globe. Some people say they love humankind. Some describe as “Love” the feeling they have when talking about their life, career, their house, their car, computer, ipod, iphone, cellphone -- or other things they own or want to purchase. No matter with whom or what, we all have found ways of “falling in Love”, or “loving” whoever or whatever we found desirable and “worthy” of the investment of our time, energy, thought and heart. We all know Love, if not through our own experience, then at least through observation or life wisdom which taught us about the existence of such an enormous Power. According to the Master Teachings, Universal Love is the 7th Power creating/ruling/affecting the world AND it is one of the internal processes that we all go through, sooner or later – at one point or another. (See “What are the 7 Powers – brief overview” for more info about the Powers). Joy, Acceptance, Lowliness (as in being humble), Equality, Surrender, Equilibrium, Reconciliation. Although the very concept of Love seems to be so natural and empowering, many of us fear Love. We fear that by feeling Love we might lose our independence, our freedom, and be taken advantage of, leaving us disempowered, humiliated, and simply feeling worthless and bad. And so, afraid of Love, we have guarded ourselves with blocks and walls – to prevent ourselves from possible hurt. Nothing can be further from the truth than anticipating that Love will lead us to disempowerment. It is the opposite: Love IS Power. Lack of Love IS lack of Power. And, when we are not in tune with the 7th Power, we tend to dwell in the “hypnotic illusion” of being in control of our fate, while experiencing fear. Opening one’s heart to Love is one of the biggest and most important steps in our evolution. It is inevitable, and cannot be omitted if we want to progress and perpetuate our existence. Please remember: Love has many faces, and, loving is not limited to a romantic bond. Even though such a (romantic) bond can become an excellent opportunity to learn about, and connect with, the Universal Love, the 7th Power. As the consciousness that we are, we can only exist as long as we are aware of ourselves, progressing through our experience. Consciousness is nothing else but a vibration, a current, a signal, if you may. And as such, we have been affected by the vibration of the 7 Powers creating the world. We need to be in tune with them in order to progress and exist. For our own good, we need to be in tune with Love. When I met with Rhami-yata in the Chamber of Seven Powers, I sat on the stone floor without a word. “You fear for your friend?” he asked. Rhami-yata’s eyes darkened. My Mind started to wander away, and I caught myself thinking that they were the same color as my wool carpet, which I’d bought years before when I first left my ex-husband. “Depends on your expectations,” said the marine-blue-eyed Master. I looked into his eyes and kept thinking of the stupid wool carpet. Here he is, - I thought – trying to educate my stubborn Soul, and all I do is let my Mind perpetuate my silliness! I wanted to protest, but he explained further that Ella was one of the vessels I had used for maintaining my self-worth. She was fulfilling my need for acceptance, for being valued and wanted in somebody’s life. But if she decided to die, leaving me without her support, I would feel hurt and abandoned. She wouldn’t be there anymore to give me what I wanted, and so I would suffer because of that. The whole conversation was very painful to me, but I felt it was very important. I wanted him to go on. But then he paused, and I suddenly felt tired. I closed my eyes, just to let myself breathe rhythmically for a tiny moment, long enough to rest my unruly Mind. Yet my Mind didn’t want to give in, and soon an image from years before floated into my restful thoughts. There we were, Jacob – my ex-husband, and I, holding hands and walking down the street of our home town, on a sunny breezy day. My visual memory now changed. I saw myself up on the roof of the highrise in Toronto. My ex-husband and my son were already asleep, downstairs, and I was fully awake. There was a couch on the roof, sheltered from bad weather by a wall extension, and it became my bed for that night. I had watched the clear skies, and the buildings downtown till morning, when the sun was “born”. I kept my eyes closed, and my Mind was filled with another image. In fast forward I saw many days fly by, and each of them was the same. My ex-husband, with his eyes closed, headphones on, listening to numerous records and dwelling in his thoughts. And me, lost in my creative ideas, exploring my own inner world, isolated from his. Two strangers, in the same room. The image in my Mind became blurred, and I wasn’t sure whether it was now Jacob or my next partner, Norman, that I saw. The man was reading a book in his room, late at night, and I was watching the stars through the window, alone in the bedroom. The Master looked at me carefully. He explained that the main reason for many long-term relationships was the subconscious fear of being left alone. Because of the unhealed emotional wounds, those who feared being on their own subconsciously believed that if there was no one in their lives to love them, it meant that they were “not good enough”. While those who moved quickly from person to person were mostly driven by the subconscious fear that if their partner discovered who they really were, she or he would run away and leave them hurt. Because again, they believed they were “not good enough” for any partner to truly love them. And there it was – another realization. Again, thanks to my invaluable teacher, I was able to understand things that were affecting my life, causing me a lot of pain. My relationships, one that was already over, and the present one that seemed to be going nowhere. They were nothing but my desperate attempts to get any Love I could. I did. And I let him know that, with another grateful smile. Once I feel a connection with the vibration of Love, - I thought – I’ll respect and treasure myself and others, equally. And then he shared with me the most beautiful thing: Love was not something one could really give or receive. One could give affection, support, or passion to one another. But true Love was not an emotion, or a thing. Love just was, enveloping everything, and vibrating as an energy wave. “Sharing Love that fills us up, not merely giving or receiving Emotions, is a true loving relationship,” I whispered. I closed my eyes and was silent for a long while. When I opened them I saw Rhami-yata sitting in front of me and looking at me with quiet patience and tenderness. Tears started to roll down my face, uncontrollably. I felt all the pain, the deep wounding of my difficult childhood, and the pain of the unfulfilled need for Love. And I felt the resentment I had created for my ex-husband, and for my present partner. Rhami-yata said that the only way was to make the decision that I would work through my pain, no matter what. I quickly nodded, letting him know that I would. The first step was to understand and embrace who I was. I told him I would do whatever needed to be done, no matter how much it hurt. “A lot of willingness,” I assured both him and myself. He asked me to begin with a simple exercise. For the next few days, I was to let myself believe that everybody, in every situation I would experience, was coming from the source of Love. If you are ready to open your heart, letting yourself connect with the 7th Power and experience more Love – everything that you need will show up in your life. Let me share another experience with you. When I was finally ready to welcome Love (after healing the wounds left by my two failed long-term relationships), to vibrate with it and fill my life and heart with that vibration, I decided to confess my hopes and fears to the Universe. And so, I wrote a letter to my future Lover – not knowing yet who he might be. A few days later my Love, Patrick, entered my life, and stayed -- for me to love him, and for him to love me. Below is the letter. I hope it might inspire you to write your own. And I hope, it might help you to open your own heart. I can feel you. And, yes, I’m not ready. But I’ll never be ready until you’ll come into my life, and make it your own. I’m terrified, I’m trembling. My eyes and ears are shot, to escape from the outside -- so that I can see the inside. I’m dying from fear, and the anticipation, hoping for your love to be greater than any of my nightmares. “Time out! Time out!” – I hear myself scream. And so I’m about to find out how it feels, how it really feels, to be with you. I can’t keep those curtains closed forever, can I? You will enter with the sun in your left palm. Your right palm has already reached me. It was smiling, yes, your right hand smiled at me in the darkness. Then the clouds parted. But the sky was too obvious, too bright. So I pulled the curtains in. And I’m keeping them closed, tight… for how long? My heart is beating fast. Filing up the night and day with the rhythm of my fear. “Go away! Go away!” – I’m about to scream. Instead, I close my mouth. My lips taste like strawberries. Is that the sweetness of the kiss to come, or is it the taste of my own blood? For more information on the Art of Loving and how to deal with old, unwanted patterns -- read the book "Master and The Green-Eyed Hope" -- Chapter Fifteen "Veils of Dying and Loving" & Chapter Eighteen "Exploring Shadowland". 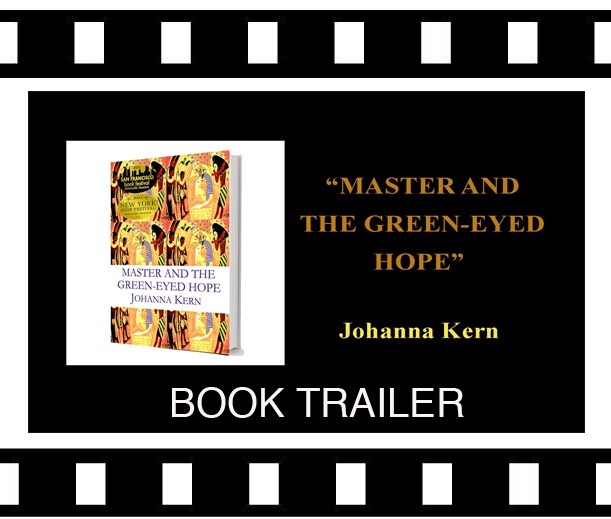 NOTE: another book by Johanna Kern will be coming soon: "Shadow Transformation -- The Banner Method". Based on the course developed by Johanna Kern -- a quick and enjoyable way to deal with your old patterns and personal Shadows. Yes, you can do it, while having fun! One of the questions, that I was thinking about already before and that came to my mind even stronger after reading your post, is what happens if we not heal our wounds or only heal them partly ? Would be very interesting to hear your opinion in that. Thank you for your sensitivity and true dedication to your growth. I am very happy that you have found new ways of looking at your life, and that you continue seeking more depth, while expanding your vision and affirming your right to unlimited joy, happiness and success. Yes, your question is very important. Every wound that we have developed, becomes a weakness that we tend to hide in our subconscious, “shoving it under the carpet”, so to speak. That wound/weakness, when not dealt with, and not healed, becomes a base for developing a Shadow, which guards such wound/weakness with, one might say, “its own body”. A Shadow always develops on top of a wound in order to help us, in order to protect the weak spot. However, such Shadow, at the same time, becomes ruthless, dark-natured bully, which begins to control our behavior and feelings. Our Shadows take over in order to prevent us from any possible harm. Whether there is a real danger, or only some perceived, possible threat, our various Shadows will come out and act on our behalf. It is as if someone presses a button and we start behaving in a defensive way, just as “robots”, on an “automatic pilot”. That means that we keep repeating the same patterns, getting stuck all over again in similar troublesome situations, perpetuate emotional pain, and -- create more similar wounds for ourselves, and others. In short: we keep sabotaging our relationships, our happiness, our right to success, abundance, our right to love and be loved. Now, it does not mean that we need to run away from love, or a chance to have a loving relationship when we are not yet healed. But it does mean that there is a great chance we won’t be able to maintain a happy relationship. UNLESS, we meet a partner who is not only willing to take such risk, but also is patient, and wise enough to know how to help us in our healing process. OR it may be that both partners still need some healing, and are able to build a loving and strong relationship while helping each other to deal with their wounds. However, that scenario is rather rarely successful, since each other’s Shadows will try to defeat the opponent in order to protect their wounds/weaknesses. And instead of a loving relationship, the result is a battle of Shadows, sabotaging the relationship and perpetuating the neurotic needs of both partners. Having said that, I need to add that anything is possible. We are all unique. We are all different. And we do know best what’s beneficial for us – the moment we truly tune into the vibration of Love. Much Love to you, Agnieszka! And thank you for your beautiful comment.